codeia set you on a sixty minute journey, combining gaze ridden doom with ethereal post-rock. The result is a bleak cinematic soundscape that fits the forlorn title – as he turned back towards the eye of the storm. Sometimes you come across albums which seem tailor-made for you, and that feeling only grows over time. I’ve been really enjoying the doomy side of post-metal, but also loving post-rock bands who employ soaring riffs throughout their music. I hadn’t really explored the centre ground, but German trio codeia have. Their sophomore record as he turned back towards the eye of the storm releases on April 13, and this record is just what I needed. In the header, I’ve briefly mentioned what genres are utilized within as he turned back towards the eye of the storm, but to leave it at that would only be doing this incredible band a disservice. 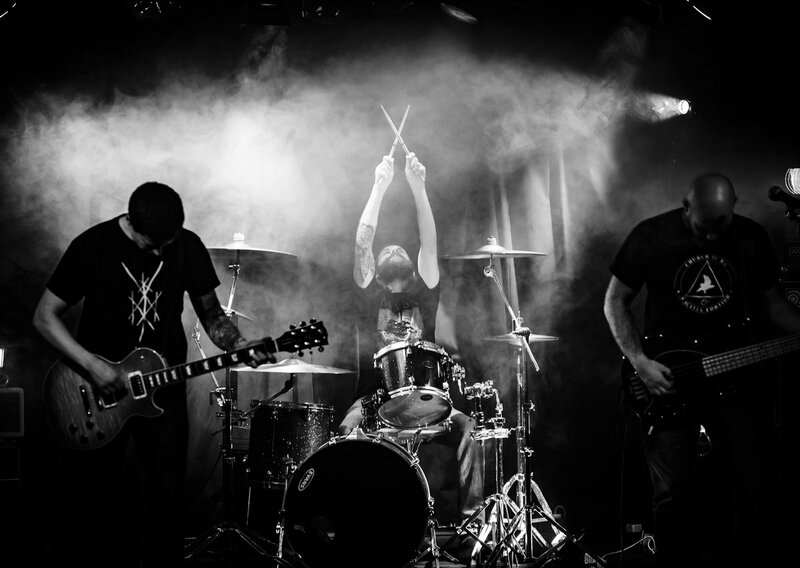 At their core, codeia are post-metal, combining heavy drums and bass with atmospheric post-guitar riffs. They also employ elements of black metal, noise, and ambiance, serving a palette of sound many listeners will love, and many other bands will envy. Not only does codeia breeze from one genre to another like gentle winds, but they also do it with flawless precision, creating a wholesome experience that you want to experience over and over. The best part is, they did a fantastic job on their debut record “don’t’ be afraid” she whispered, and disappeared too, meaning you’ll have two and a half hours of exceptional music to sink into after you’ve finished this review! The opening track is a twenty-minute leviathan, and it is worth every second. The track builds from an ambient opening, filled with rich, calming atmosphere, influenced by soft post-rock. With slow vocals added in, codeia lull you into a sense of false security, before opening up the floodgates and letting the riffs wash away that calmness. The band’s guitar tones are really rough around the edges, which only lends to an aura around the songs, in both the light and dark sections. “canon of echos” continues to develop throughout its span, and the twists and turns through metal the band take draw sharp comparisons to Neurosis and, most recently, DVNE. Later in the song, you hear the bass emulate Tool in ways too, a thick bassline warbling softly as the guitars drift away on tangents. You can read my thoughts on “emerald deception” in our premiere here. In the context of the album, the song works perfectly. “canon of echos” is much heavier than “emerald deception”, and it’s a welcome change as you move into the more hypnotizing and introspective second track. I really like the long, winding instrumental sections from codeia; they allow you to really contemplate the music or the moment you’re experiencing. Songs like “Mantra” and the vinyl version of the song “Mantra / Karma” use elements of noise brilliantly. In these tracks, you’ll find thickly distorted guitars drown out the smatterings of calm atmosphere, like a storm front rolling in from the sea. Fuzzy waves of sound bathe the listener before returning to droney post-rock. Picking a favourite from the album is tough; for me, it is a tight call between “canon of echos” and the ‘final’ track “medallion”. The latter ascends to a beautiful post-rock finale, and despite harbouring the same fluidly random genre structure, feels like it hits a bigger and more emotionally powerful post-rock crescendo. Before reaching that point, the song feels like you’re being tossed from mosh pit to calm beach, and back again, leaving you ready for the sanctuary of that recharging finale. I wholeheartedly support fans of gaze to check out this album, as much as I do fans of doom, drone and post. It’s a beautiful journey through some bleak but fulfilling soundscapes, amazingly created by just three members. codeia have produced a record many bands would be proud to release, and I will be consuming as he turned back towards the eye of the storm and “don’t’ be afraid” she whispered, and disappeared en masse during the coming months. You couldn’t ask for more from an album, and it joins a host of exceptional post/black-metal releases this year. Next PostSilversun Pickups Announce New Album with New Song "It Doesn't Matter Why"